After 5 years studying cheesemaking and developing a business plan, brothers Mateo and Andy Kehler bought 15 Ayrshire cows and began their dairy in July of 2002. The Kehlers began farming and making cheese with a goal of creating a model to be replicated by other farmers in Vermont who saw the need to diversify their quickly disappearing farms into more workable options. They wanted to demonstrate that it is still possible to prosper as a farmer on a rocky Vermont hillside. They wanted to create a vehicle for the renewal of Vermont’s local dairy economy in the form of a business model that could be replicated on other dairy farms. In 2008 the Kehlers built The Cellars at Jasper Hill, an innovative 22,000 square foot underground facility next to their own barns and creamery. The Cellars were constructed for the purpose of providing affinage, or aging expertise, as well as distribution and marketing services for local cheesemakers so that their products could be available in the burgeoning market for artisan cheese nationwide. In 2010 the farm became an anchor tenant of the Vermont Food Venture Center in Hardwick with the intention of expanding Jasper Hill’s operations to this innovative shared-use facility designed to support new businesses that contribute to Vermont's working landscape. Jasper Hill makes cheese in a small, private creamery within the Venture Center. The intent of this space is to incubate new cheeses and new cheesemakers so that they may eventually be moved to a revitalized dairy farm as opportunities arise. Cheese made at this creamery is sourced exclusively from the well-bred Holsteins of Andersonville Farm in Glover, VT. The team at Jasper Hill Farm is involved in milk production at Andersonville in order to create milk that is uniquely suited to cheesemaking. 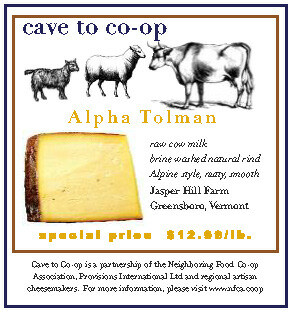 Alpine-style Alpha Tolman is one of Jasper Hill's newest cheeses and is made exclusively at the creamery located within the Food Venture Center. Alpha Tolman is named for a philanthropic dairy farmer who built the Greensboro library in 1900. Alpha's grandfather, Enoch, was one of the town's original settlers. Alpine cheeses like Appenzeller inspire the recipe for this Jasper Hill Creamery original. The cheese is made from raw cow milk, has a lightly brine-washed natural rind and is aged 8 to 12 months in the Cellars at Jasper Hill. Alpha Tolman has a buttery, fruity, nutty flavor when young, developing bold meaty, caramelized onion flavors as it matures. The texture is dense and pliant, easily portioned and ideal for melting. The texture, aesthetic, and flavor make Alpha Tolman an ideal choice for fans of Appenzeller (or fondue!). Try pairing with a robust ale, plummy red wine, or onion jam. For a satisfying meal, follow the lead of Swiss/French raclette – melt onto a plate of fingerling potatoes, cured meat and natural sour pickles. Here are some recipes using Alpha Tolman that are wonderfully suited to the coming of autumn and its slightly cool weather which whets our appetites for more complex and serious foods. a classic Alpine dish – make sure you work up an appetite – serves six ! Boil the potatoes in well-salted water until just tender to a fork, but not cooked right through. Drain well and leave to cool. Meanwhile, melt half the butter in a frying pan and sauté the onions and bacon until the onions are soft and both are beginning to brown. Add the wine, bring to a simmer, and reduce to nearly nothing. Stir in the cream off the heat. Preheat the oven to 400°F. Cut the potatoes into smallish cubes, melt the remaining butter in a frying pan and sauté the potatoes until golden. Cut the cheese in thickish slices. Rub an ovenproof dish with the cut clove of garlic, then cover the bottom with half the potatoes. Spoon over half the onion and bacon mixture and season well. Top with half the Alpha Tolman, then repeat the layers, with the remaining cheese on top. Bake for 15 minutes until browned and bubbling then serve with lots of crisp green salad and a large glass of dry white wine. Preheat the oven to 400°F with a rack in the upper third of the oven. Line a large baking sheet with parchment paper. Melt the butter in a large skillet and add the onions with a pinch of sugar, salt and pepper. Cook over medium heat until caramelized and golden, about 15 minutes. Add water and scrape up any bits from the bottom of the pan; cook until water is absorbed. Add thyme and transfer to a bowl. On a lightly floured surface, roll out pastry into a large rectangle, roughly 16 x 13 inches. Cut in half lengthwise. Transfer both pieces to the prepared baking sheet. Brush edges with water and fold over to form a ½ inch border. Using the back of a fork, press edges to seal. Prick holes in the bottom of the tart (not on edges) with the fork. Brush the bottom of each tart with 1 teaspoon Dijon mustard. Divide the caramelized onions among each tart, followed by the shredded cheese. Arrange slices of tomato in an overlapping line down the center of each. Sprinkle with salt and pepper to taste. Bake in the upper third of the oven for 22 to 25 minutes, or until golden. Cool slightly and sprinkle thyme leaves over the top to garnish. Serve warm or at room temperature. Wash the endive and radicchio. Cut off the bottom of the endive and peel away the leaves, slicing more from the bottom as you get closer to the center to loosen the leaves. Cut off the bottom of the radicchio. Set the base on the cutting board and slice in half from top to bottom. Slice once more in the opposite direction. Being careful not to loose too much of the leaves, remove the core and cut each of the radicchio quarters into three pieces. Add this and the parsley to a large bowl. Put the mustard, shallot, lemon juice, olive oil and salt in a small bowl and whisk or stir with a fork until the mixture emulsifies. Add the hazelnuts, cherries, dressing and half the Alpha Tolman to the large bowl. Mix with your hands. Salt and pepper to taste. Divide onto plates and top with the remaining Alpha Tolman.